Reports are in pdf format. To download a free copy of Adobe Acrobat Reader, click on the icon below. Could it ever happen, that the world's oil shortage leads to a hybrid powered or even solar powered Formula 1 Grand Prix?? 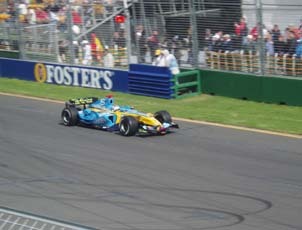 The third round of the World Formula 1 Championship was run on Sunday 2 April at the best street circuit in the series, Albert Park in Melbourne. 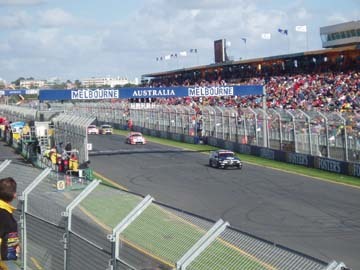 Usually Melbourne hosts the first round but the super Commonwealth Games took priority and rescheduled the Melbourne appearance on the GP calendar. Already the season was showing a possible changing of the guard with Renault super competitive but not dominant over Honda, Toyota, McLaren-Mercedes and Ferrari. 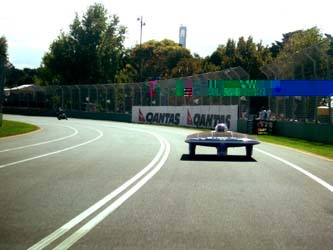 Greenfleet made a well noticed appearance with a special marquee displaying the fuel efficient vehicles that had competed in the Technology Trial just a few days earlier. 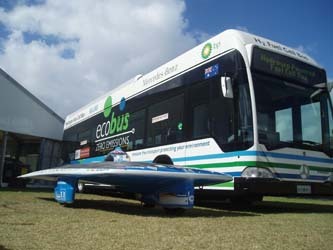 This included the eye catching Hydrogen fuel cell buses from Perth and the Aurora 101 solar car as well as the two seat electric car from Adelaide, 'Trev'. 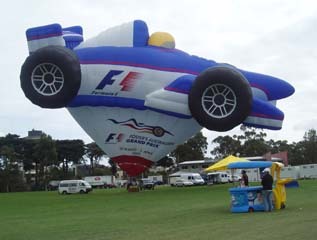 The big thrill was the 5 occasions when the Greenfleet vehicles were allowed to take to the track in special demonstration laps. 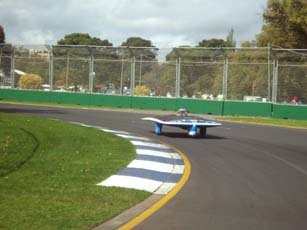 Aurora already made apologies for being almost silent as it travelled around the Albert Park circuit, but its sleek low look won many admirers and was adopted by the schoolies in attendance as 'their race car'. 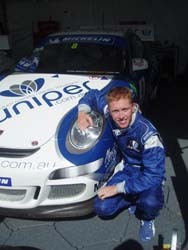 Aurora team member Ian Dyk was driving in the Michelin Carrera Cup events. 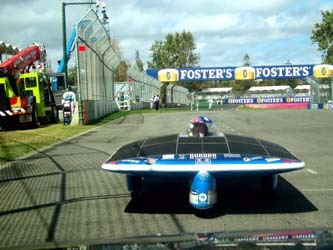 Team member Darren Trafford did flag marshal duty on Turn 7 and Derrick Rodgers complete with broken leg turned up from Hamilton to drive the solar car. Thursday and Friday was school groups day. 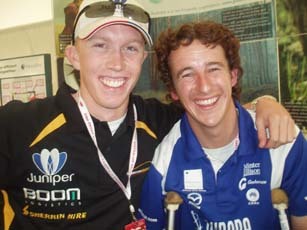 They loved both the Aurora solar car and Trev. Posters and brochures were exhausted by Thursday afternoon. 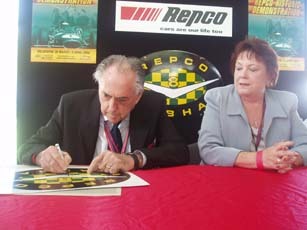 Aurora Association patron Sir Jack Brabham was featured in the REPCO display along with his famous Repco Brabham Formula 1 winning car. Sir Jack turned 80 on 2 April. 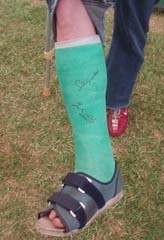 Derrick made sure that his leg cast also got an autograph from Sir Jack Brabham as well as Stirling Moss. 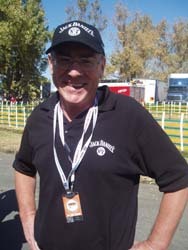 We met Larry Perkins, owner of a brace of V8 Supercars, but famous in solar car circles for building and driving [with Hans Tholstrup] a solar car from Perth to Sydney in 1982-83. 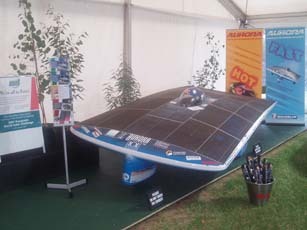 It took 21 days for the 4000 kilometre journey but made history as the first long distance trans-continental solar car journey. Aurora now holds the record for this trip in just 8 days. 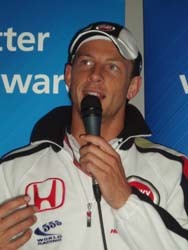 Pole sitter Jensen Button produced the fire works at the end of the Formula 1 race blowing his engine and rolling to just 20 metres of the finish line. 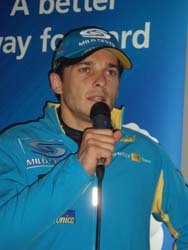 Fernando Alonso won ahead of Kimi Raikonnen and Ralf Schumacher. 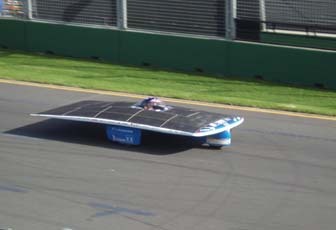 The Aurora team immediately resumed work on the super solar car to improve its handling, reduce weight and improve safety in readiness for three more appearances on Formula 1 tracks during 2006. More to come.